The Truth Against the WorldSarah Jamila StevensonI am reading books that I think will be suitable for our High School students. Regrettably, most are not well written with not very good stories. This book was an exception; well written, authentic in its Welsh setting (the author is an American, so congratulations, very well researched)and a charming ghost story. The characters were well drawn and sympathetic. No 'soppy' romance between the the two teenage characters, but a suggestion that there was a fondness there that could develop. A very satisfying little story, which I'm sure teenage readers would enjoy.Read 16th February 2014I rate this 4 stars. Review courtesy of Dark Faerie TalesQuick & Dirty: A haunting and tragic tale rich with Welsh history, but lacking in action. All the same, I thought it was a very enjoyable read.Opening Sentence: “Right over there, behind the old church.”The Review:The Truth Against the World is about two teenagers, Gareth and Wyn, who are sure about one thing — their family histories that they have been told are filled with gaps, and something big happened in them. Brought together by Wyn’s blog and the ghost of a lonely child, Orwen and Gareth must discover the truth no matter what it takes — and bring peace to the restless spirits of a six-year old girl.Orwen’s great grandmother is a proud Welsh lady, living in the US, and a sick one. We watch with Wyn as her Gee Gee slowly dies an inevitable death with cancer. It’s impossible not to empathize with Wyn, and I really liked her character. She’s shy, but at the same time, strong and proud. Writing is how she expresses her emotions, and reciting Welsh words in her head. And then we have Gareth, of London. He’s a more typical teenager to the naked eye, but we see how he feels in the chapters that are narrated by him. I don’t have much of an opinion when it comes to which point of view was better, because each point of view was unique with a vague poetic quality to it. When it comes to romance in this book, I guess there is a little; no serious relationship or even kissing though. You can see as Gareth and Wyn get closer, but the love moved super slow.The pacing of this book was definitely slow, but not necessarily in a bad way. For me, it worked, the slowness in which it moved, but I was a patient reader. The author is trying to get across the points and clues in the mystery, and in some ways it works, others it’s overkill. After all, its a kind of complicated storyline and needs a little review to really get it, and I did! For impatient people who love lots of action and romance, I would suggest another novel. But for people willing to wait to get clues to the plot, and don’t mind a lack of action, I think you will enjoy this. It may be slow but there is beautiful descriptions of Welsh scenery and the language, and it has an aura of magic around it.The imagery of the little ghost girl, Orwen (a different Orwen from the main character, who goes by Wyn) could be creepy at times. It wasn’t a vengeful spirit who wanted revenge or anything, just a sad dead girl who needed help. In one scene, Gareth sees Orwen the ghost in the mirror and his phone rings. When picking it up, he hears her voice talking to him, and let me tell you, this frightened me. I don’t know, when it comes to scary books, this for the most part is on the lower part of the list — but still, very very freaky. But I was reading at night, when it was raining, too, so I’m not that much of a scaredy cat, right?The Truth Against the World was an enchanting book that I recommend to fans of Where the Mountain Meets the Moon. Heavily focused on Welsh culture, I loved learning a tiny bit of Welsh, such as hywl fawr: goodbye. The Welsh language is so gorgeous and flowing, and before reading this all I knew about Wales was that it was a place. I’m happy I got to learn more about it the best way I know how, a book! Try out this novel, and hywl fawr.Notable Scene:At first all he heard was the sound of the wind. And then, a voice like a breath, a little girl’s voice.“You promised.” She whispered. “I’m so lonely. You promised.” All the while, she looked at him, pleading. He felt as if his heart might break, yet at the same time he was terrified. He hung up the phone; put it back on the desk. But he didn’t loom away. Gradually the little girl’s form faded, and all her could see through the window was moonlight and the dark shapes of neighbor’s houses, his own reflection wide-eyed and pale.FTC Advisory: Flux provided me with a copy of The Truth Against the World. No goody bags, sponsorships, “material connections,” or bribes were exchanged for my review. To see my full review:http://abookvacation.com/2014/06/08/a...This was a very interesting concept, but the development of the story was just a tad slow for me. Part of this stems from the fact that I was able to predict many of the events prior to them happening, which in turn made the mystery aspect of the novel fall a bit flat. I did like the main characters, but much of their conversations and actions didn't pique my interest. Much time is spent leading up to their meeting and hashing out theories, but I didn’t feel that there was very much action within the novel at all, and I really need more action to keep my attention. Unfortunately, this novel just wasn’t for me. A just-the-right-amount-of-spooky ghost story with fully realized characters and a fascinating setting. Prompted me to get out a map and look a few things up. The Truth Against the World is a ghost story and a mystery. Gareth Lewis is on a family outing when he stumbles across a cromlech with a grave marker for a little girl named Olwen Nia Evans. While searching for his phone that he dropped, he meets the ghost of the little girl, who gives him back his phone. This encounter prompts Gareth to research this Olwen and his search turns up a blog run by a girl in the United States with the same name.Wyn and her family are preparing to visit Wales for awhile, as her great-grandmother (or her Gee Gee), wants to spend her final days in her home country. An email from Gareth prompts Wyn to try to get more information from her Gee Gee about her life before moving to the States, but for some reason she's not talking. Wyn also starts having vivid dreams about her Gee Gee when she was young and still in Wales.With Wyn's dreams and Gareth being pretty much haunted by the ghost of a sad and lonely little girl, they make plans to meet in Wales and try to figure out this mystery for themselves since no one wants to talk about those days when young Olwen was alive.What I liked:I liked the mystery in this book. Wyn and Gareth are trying desperately to figure out who the little girl was before Wyn has to go back to California. With Wyn's grandmother constantly skirting around the subject while she is still able to talk at all, they turn to the museum and the townsfolk that knew Wyn's Gee Gee.I also quite liked the characters in this book. They weren't the most excited characters to read about, to be honest. But they were very likable to make up for it. Gareth is trying super hard to help Wyn figure this all out. He's a really great friend to Wyn during these hard times with her Gee Gee's health slipping away. He's a little sweetie.Wyn is dealing with a lot. Watching her Gee Gee dying and trying to figure out this mystery and dealing with her strange dreams. It seems like she was needing a friend too because her friend from school seemed to always be too busy to hang out with her. So it's good that she found Gareth. Or rather Gareth found her.I liked the relationship between Wyn and Gareth. There isn't any romance in this book, but there is definitely a potential for it. I liked their friendship and how they were there for each other despite not knowing each other for very long.What I did not like:While I did somewhat enjoy this book, I felt like I waited way too long for something to actually happen. I think it was like 200 pages before I felt myself getting at all invested in this book. I didn't hate the beginning of this book, there wasn't anything bad about it, but it was kind of boring. I'm glad that I ended up taking this book with me on my flight to Indiana earlier this month because I don't really know if I would have been able to make myself keep reading if I had other options.I found the mystery to be kind of predictable. For the most part, I don't think it's meant to be set up to where you can't kinda figure out what's going on, but I had the end twist figured out really early on in the book.The other thing I didn't like about this book was how time passed in this book. It felt like it just passed really oddly. Like when you're reading about Wyn and Gareth's interactions, it feels like they got together were like, "Oh hi, I have to go, bye!" But I think I was supposed to believe that they had been hanging out for a more significant amount of time than like 3 seconds. I don't know if that's a good way to describe how I felt about this, all I know is it threw me off more than once when I was reading.Overall, this was an okay book. The characters were likable. The mystery was interesting, if a little bit predictable. I think this book would probably be good for readers who are perhaps a bit on the younger side. Sarah Jamila Stevenson's The Truth Against the World is a modern-day Welsh ghost story that proves that ghosts can be from any era and bound to earth for any reason. It's about the secrets people keep and how a coincidental discovery of a tombstone out at a deserted ruin at the seaside can unravel those secrets decades on. While the story Wyn and Gareth discover is tragic, their story itself is lovely and astonishingly free of insta-love and relationship drama. Instead the focus is squarely on Olwen and helping her find peace.Wyn and Gareth were interesting characters. While I connected more strongly to Wyn, I really liked Gareth and his gentle ways. Wyn is a regular girl, neither popular nor ostracised at school, though with her best friend busy with the student council her life there has become somewhat lonely. Add to that the fact that her grandmother Gee Gee has to move in with her family due to terminal ill health and things are getting increasingly hard and she's becoming more isolated. Gareth, on the other hand, only starts feeling isolated once he encounters little Olwen in a cromlech and she starts haunting him, appearing on his phone in pictures, calling him and changing his ring tone to an old Welsh tune. When Gareth finds Wyn while searching for information on Olwen, they immediately feel a connection, but it isn't a romantic one. Instead it is kinship and their mutual link to Olwen that draws them together and even if there is a growing attraction and the possibility of more, that is all in the future and not really relevant to this story.I loved Wyn's bookishness and her strong desire to learn more about her Welsh heritage and learning the language. Her bond with Gee Gee was lovely and I completely understood her need to know more about her great-grandmother's youth in Wales. This book made me wish I'd asked my grandparents more about their youth and their experiences during the war. Gareth made me laugh, especially his bickering with his little brother, which was very recognisable having two of those myself. The only characters beyond Wyn and Gareth that I really felt were fully fleshed-out were Gee Gee and Wyn's parents. The other characters felt somewhat distant, except Hugh and Annie, but even they are only known as the cabbie and his wife, who help Wyn practice her Welsh. I guess this emphasises how isolated Wyn and Gareth feel. This isolation is echoed in Gee Gee's story and in the atmosphere of this small Welsh town, where nothing happens and time has seemingly stood still.The Truth Against the World is a combination of a mystery and a story about dealing with love and loss. Gee Gee's passing and the months leading up to that are poignant and not just sad, but beautiful too. As for the mystery, the clues and links between them are seeded throughout the book and are there for the finding. A reasonably perceptive reader will be able to piece the clues together on their own before Stevenson reveals the solution. The eventual resolution of the story was clever and I really liked how it was all linked together. All the lead characters in this tale are left with some sort of peace, even if the grief and pain haven't miraculously disappeared.Stevenson's love of Wales, its countryside and vistas, and its language clearly shine through in the narrative. Stevenson also writes their internal dialogue quite well, but there were some elements of the narrative that didn't work for me as well. For one, the pacing felt somewhat uneven. Sometimes large amounts of time flew by with hardly a mention and then we spent entire chapters on just one event. And the tale felt a bit meandering in places, which made the story feel a bit padded. But my biggest peeve with the book – and one that is wholly personal and probably a librarian quirk – was the fact that Gareth's computer skills often were demonstrated by his finding things online. This in itself isn't that bad, but the fact that it's painted several times as nothing else but plugging a couple of search terms into Google made me grumpy. Yes, the fact that he narrows his search terms cleverly is great, but quite often finding information goes far beyond Google-fu and finding the right search terms. But, again, that might just be my professional prejudice showing.On the whole, I had a lovely time with The Truth Against the World. Gareth and Wyn are great protagonists and their tale of a ghostly girl looking for peace is haunting and compelling. If you like modern-day ghost stories and one set in a different from usual locale that Sarah Jamila Stevenson's The Truth Against the World is certainly a book that should fit your tastes. I really enjoyed Stevenson's writing style and I'd love to read more of her work in the future.This book was provided for review by the publisher. 3.5 StarsOriginally posted here at Random Musings of a Bibliophile.I read Sarah Jamila Stevenson's The Latte Rebellion earlier this year and enjoyed it. When I discovered she had a new book coming out this year that took place in Wales and had a ghostly element to it, I couldn't wait to read it. The Truth Against the World delivered nicely on its promise. Wyn is fascinated by the history and folklore of her great-grandmother's native Wales. She has grown up listening to the stories and hanging on every word. She even recently began trying to learn to speak Welsch. Gee Gee's dying of cancer and wishes to return to her homeland one more time and it Wyn and her parents are taking her. Wyn is deeply upset by Gee Gee's impending death. They are very close. This is what I really loved about this novel. I liked Wyn's relationship with Gee Gee, her relationship with her parents (even when strained), and father's relationship with his grandmother. This book is all about the ties of family and history, how those things affect our present and future. Stories that explore these things are favorites of mine and I think Wyn is an excellent character for exploring them with. Gareth Lewis, the boy who finds Wyn online after having a disturbing encounter with a ghost bearing her name, is also an excellent character for this. His great-grandfather lives in the same town Gee Gee is from. He and Wyn have an eery amount of things in common, including the strange things that are happening to them. I appreciated how genuine both of these characters read. They are both only 15 and their parents are heavily involved in all of their decisions and actions. The interactions between both teens and their parents are ones that occur in households the world over every day. They both sound young, because they are young, though intelligent. This is a slower story. It unfolds piece by piece. Don't go into this expecting to get a thrilling tale of creepy hauntings with twists on every page. It is not that sort of book. The mystery that Wyn and Gareth are unraveling is not all that difficult to figure out as an outsider (and an adult), but I thoroughly enjoyed watching them make the discovery themselves at the same time discovering each other, the town of their heritage, and the past. If you enjoy the sort of book that does all of these things well, this is one you should definitely pick up.I read an e-galley received from the publisher, Flux, via NetGalley. The Truth Against the World goes on sale June 8th. 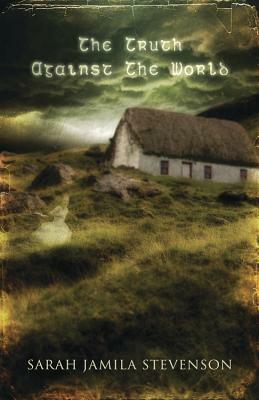 When I requested The Truth Against the World on NetGalley I read the synopsis and was drawn towards the Wales setting and the paranormal touches, but then for some reason I got it confused with something else and kinda was expecting this one to be another dystopian!It took me a little while to realize it was told in dual POV, I kept getting confused and was wondering who was Gareth and why all of a sudden everything seemed different and the narrator was referring to himself as Wyn but then it was not a he but a she? I usually don't get confused too easily, but it took me quite a few pages to actually figure who was who and where were they and what was going on with them.If there was something I completely loved in this book was the setting, I adored how genuine and well researched all the Welsh and the locations in Wales seemed to be. I felt very much present in the place and location and it made me wish I was there walking those green rolling hills. I loved the Welsh proverbs at the start of each chapter. And I loved the lil tidbits of history we keep on snatching here and there about life in the Welsh countryside during World War II.The paranormal aspect was quite well done, with enough plausibility to it, with enough creepiness and tension added with the dreams, visions and strange happenings related to the ghost.The mystery of sorts that needs to be discovered or figured out to put the ghost to rest was intriguing enough but not so difficult to figure out since there was a lot of emphasis on the connection between the two main characters. Still, it was quite well woven, even if it seemed to have dragged at bit all over the book and was only solved in the two final chapters.Wyn and Gareth felt like genuine teenagers and their frustration at being treated like kids and being watched too closely and feeling suffocated by their families came out quite well on the page. I was quite glad that despite their odd connection and strange happenings, no romance was thrown onto us on this book and for that I'm grateful.With a very well done setting and genuine characters this was an interesting book, it just seemed a bit too leisurely paced, with not too much happening in it, though there are plenty of issues addressed. Still, I'd give it a 3 stars, maybe a 3.5 since it managed to really make me want to visit Wales soon! Olwen Nia Evans, Wyn for short, loves her grandmother Rhiannon a lot and through her has developed a fascination for things Welch. She knows some of her family history, but not as much as she would like. When Gee Gee, as she calls her gran, learns she's dying, she asks to do so in the small Welsh town she left a long time ago. Wyn has mixed feelings. She's going to miss her friends and home, but is excited at the opportunity to learn more of her gram's native language and the country where she grew up. She's been blogging online under the title Born To Wyn about her thoughts and about a series of dreams she's had that are making sleep a very elusive quality. She's beginning to wonder if anyone reads what she writes when she gets an email from a boy her age who lives in England named Gareth Lewis. He's just returned from visiting his great grandfather in Wales. While there, he found a burial cairn with Olwen Nia Evans: 1944-1950, inscribed on it. Right after finding it, he tripped, losing his cell phone in a small cavern under a large burial cairn. Inside a ghostly little girl tells him she's lonely and hands him his phone before vanishing. Gareth, extremely unsettled by the experience, googled the name and found Wyn's blog. As they email and Skype each other they realize that the dreams and images they've begun to have are similar. When Wyn and her family arrive in Wales, plans have been made for Gareth to come for another visit with his great grandfather who lives in the same village. By the time he arrives, Wyn has realized that Gee Gee has never told anyone much about what happened before she married and moved to America. Wyn is desperate to get her to talk before she dies. Unfortunately that doesn't happen and she and Gareth must play detective, something her parents make extremely difficult, in order to uncover the connection between the mysterious ghost, Gee Gee and what took place over fifty years ago. What they uncover is a connection neither could have imagined	This is a neat juvenile mystery with some fantasy elements. Tweens who like ghost stories and spunky heroines will like it a lot. The Truth Against the World is an interesting ghost story. Olwen Nia Evans and Gareth Lewis, two young people a world apart, connect through the internet.In California, Olwen (Wyn for short) posts some of her puzzling dreams on her blog. Her great-grandmother Rhiannon is terminally ill, and Wyn's life is shadowed by this imminent loss. Gareth, in London, has also been having strange dreams. After a disturbing incident in Wales involving the ghost of a young girl near a grave marked Olwen Nia Evans, Gareth has had more than dreams to contend with--photographs show images that can't be explained and his phone seems to have a ghostly connection.Gareth's online search for an Olwen Nia Evans leads him to Wyn's blog. The two begin a conversation and discover that both families have roots in the same small Welsh village.Wyn tells Gareth that her family will soon be visiting Wales to honor Rhiannon's wish to die there, in the village where she was born. Gareth arranges to visit his great-grandfather in order to unite with Wyn and hopefully solve the mystery behind their strange dreams.This YA/Juv novel provides an interesting plot with likable characters and a supernatural element that works well. No gratuitous angst or sexual imagery. No condescension to a false image of adolescence. A neat little ghost story that both Middle Graders and adults can enjoy.I particularly enjoyed the inclusions of the Welsh language and proverbs.Read in January; blog post scheduled for May.YA/Middle School. June 8, 2014. Print version: 360 pages. This YA/Juvenile ghost story/mystery really held my attention. Yes, I figured out the mystery early on, but I'm not the intended target audience.I enjoyed reading the Welsh proverbs that began each chapter and being immersed in the Wales setting and history during this novel. The fact that Wynn and Gareth took such an interest in their family histories was wonderful and maybe would inspire teen readers of this book to do the same.Both Wynn and Gareth were highly likeable and very believable characters. Their initial awkwardness and hesitancy toward each other seemed very typical of that age group and I laughed out loud more than once at the thoughts in their heads. The only aspect of their relationship I had a problem with was the mention of the "electricity" and "static charge" they felt whenever they touched. Their feelings toward each other were obvious and those phrases just seemed out of place in this book.The Truth Against The World is due to be published June 8, 2014 and I would highly recommend it to ages 12+ for a fun and interesting read.This review is based on a digital ARC from the publisher through NetGalley. Let's start with the positive. I loved that the book was set in Wales (not many modern books can say that)and immersed readers in the language and culture and the geography. I loved that it gave readers a sense of the hardships the people faced during World War II. These positives, however, could not make up for the pitfalls of the rest of the book. Maybe I had the benefit of an outsider's perspective, but I was able to figure out the mystery of the ghost girl Olwen at the very beginning of the book. Since that was the whole point of this story, it made for a very unsatisfying read (and I wanted to Gibbs head-smack the main characters for not uncovering the truth in a more timely manner). Oh, and here's some sensible parting advice from your friendly neighborhood librarian: internet safety. Let's not go chatting with and arranging to meet someone you've just met online, no matter how much of a 'connection' you feel you have with one another. My grandmother didn't have long to live. I visited her at the hospital, and I had a tremendous sense of lost opportunity. Grandma Marlyn was wise. She was a self-educated successful entrepreneur. She was the embodiment of American bootstrapism, and her greatest commitment was family. So here I am at her bedside. I feel the weight of loss. Everything she'd learned from her voluminous library. All her secrets. Regrets. Triumphs. Everything was going with her, and I wished there were some way to hold on. Or rewind so I didn't squander so much of our legacy. Stevenson writes a book that excavates these feelings. The protagonist is racing against the reaper to resolve a secret torment in her grandmother's life. Stevenson explores the tragedy of loss, from the intimacy of a lost loved-one to the end of an entire culture. The story was longer than it needed to be. The plot was moved along with dreams that were just too vivid and detail to be believed, even for a person gifted being dream seer. It was plain long before the book ended what the great grandmother did in her youth and who the father was of the ghost child. Also, I didn't quite understand why the book was given the title, Truth Against the World. On the plus side, it introduced the Welsh language and hopefully impressed on young US readers that the reason why the country is call the United Kingdom, is because it is made up of England, Scotland and Wales (and Northern Ireland), and that is the Welsh people do not consider themselves English or from England. I liked the connection between the Nia and her Gee Gee, along with the smattering of Welsh (which looks quite challenging to learn). Since I can't understand blogging about your dreams and emotions for anyone in the world to read, I was dismayed (like Nia's parents) with the accidental contact Gareth initially made. The realistic wartime situation in the small Welsh village in which Gee Gee grew up still haunted some villagers as well as Gee Gee herself. Helping a ghost resolve its restlessness can only be good. I loved this book. A terrific read with a paranormal hook, a touch of romance, and a magnificent setting-- perfect for a ghost story. The genuine innocence of the two narrators was heartwarming, and the slow revealing of family secrets kept this reader entertained and moved. Yes, the mystery is fairly easy to figure out, but I think the story is charming. I would recommend this book for middle school readers in particular, as the romance is pretty tame. I enjoyed the setting of this book. I was thrown off at first by the fact the every other chapter was told told by the Olwyn or Gareth. To make it even more interesting, Gareth's chapters were always told in third person and hers were in first person. As the story unfolded, we get to know the two kids and their families. I enjoyed the setting being in Wales. This book was ok. The cover is striking. Not one of my favorite books. But still would suggest to others. 3.5 starsI got this book with my daughter in mind but she wasn't interested so I read it. I liked it quite a bit! It was creepy but not too creepy. I liked that the relationship between the 15 year olds was appropriate. That is unusual. I liked that the families seemed real. There was only a little bit of teenager-ness, which was nice. This book has a Welsh setting. It's a ghost story that involves two teenagers. They are close and share a personal space without falling head over hills for one another.The grandmother lives in the US and very sickly.There are no illustrations, very little action and more of a younger teens book.I can't say that I'm disappointed, but I can say that it was not what I expected. I enjoyed the atmosphere and ambiance of the remote location in Wales and references to Welsh language and culture. The story was refreshingly original, but I like my ghost stories with more thrills & chills; this is more of a family drama than a thriller. Left me wanting. Full review to come. The narrative pace was achingly slow! So sad because I LOVE the concept and the setting. And the cover is gorgeous! But to be blunt, I was really bored. :( Bummer. Creepy, with a little romance. Sarah Jamila Stevenson - Sarah Jamila Stevenson is a writer, artist, graphic designer, introvert, closet geek, enthusiastic eater, struggling blogger, lapsed piano player, household-chore-ignorer and occasional world traveler. Her previous lives include spelling bee nerd, suburban Southern California teenager, Berkeley art student, underappreciated temp, and humor columnist for a video game website. Throughout said lives, she has acquired numerous skills of questionable usefulness, like intaglio printmaking and Welsh language. She lives in Northern California with her husband, who is also an artist, and two cats with astounding sleep-inducing powers.